Fresh horseradish. On the black Wooden desk. Top view. You are most likely familiar with horseradish as a condiment for meat and sandwiches. A member of the mustard family, horseradish has great medicinal value. Its recorded use dates back to ancient days when it was used to treat many diseases and ailments. Not only can you use this spicy root vegetable on your steak, but you can also use it on your skin and hair. I discovered the healing benefits of horseradish when a friend suggested that I use it to lighten my age spots. To my surprise, horseradish was a remarkably effective remedy. Make a mixture using organic apple cider vinegar and horseradish. Put this mixture in a jar with a lid. Leave the mixture on your counter with the cover on for two weeks. Shake the container daily. After two weeks, strain the mixture and put it in the refrigerator. Apply the mixture to your skin using a clean cotton ball. Leave it on the blemish for about twenty minutes and rinse off with warm water. This flavorful root intrigued me, so I did some digging into the therapeutic benefits of horseradish. The innumerable health benefits of horseradish are due to its high mineral content including dietary fiber, vitamin C, folate, calcium, magnesium, potassium, zinc, and manganese along with powerful enzymes and oils. Horseradish helps reduce blemishes: To remedy blemishes, blackheads and acne, grate horseradish and combine it with buttermilk and glycerin. Let the mixture sit overnight and strain. Apply the mixture daily to blemishes, blackheads, and acne. Rinse with warm water and pat dry. Horseradish can prevent hair loss: Horseradish helps increase blood circulation to the scalp and this, in turn, increases hair growth and prevents hair loss. Make a horseradish poultice by grating the root and placing it on a small piece of cotton cloth. Tie the cotton and rub the poultice on your scalp several times a week before shampooing. Horseradish remedies urinary tract infections: Horseradish contains antibiotic properties that have been found to be just as effective, and sometimes more effective than conventional treatments. Horseradish also contains sinigrin which is a potent diuretic that can also help combat urinary tract infections. Horseradish remedies respiratory ailments: Traditional medical practitioners use horseradish root to remedy bronchitis, cough, colds, and sinusitis. In one study, a drug containing horseradish was tested against conventional antibiotics. The results demonstrated that horseradish was able to treat sinusitis and bronchitis in similar ways as conventional therapies. Horseradish encourages healthy digestion: Enzymes in horseradish can stimulate digestion and help with regular bowel movements. It also stimulates the production of bile in the gallbladder which can aid in digestion. Horseradish can boost your immune system: Horseradish contains a high amount of vitamin C which can boost immunity and help reduce harmful free radicals. 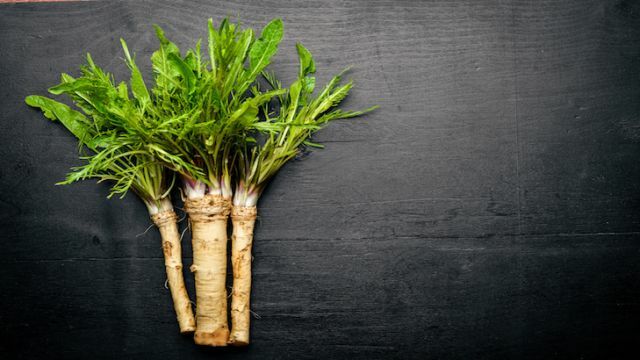 Horseradish busts inflammation: An Italian study states that horseradish can help reduce inflammation, which is the leading cause of most serious health conditions such as diabetes, heart disease, and cancer. Chinese medicine practitioners use horseradish to help reduce inflammation from injury or give relief from arthritis. Horseradish can combat cancer: Horseradish contains glucosinolates that activate cancer-fighting enzymes, which can be beneficial to cancer patients. Glucosinolates are also found in plants and protect the plant from toxins in the environment. Horseradish contains ten times more glucosinolates than broccoli. Studies show that horseradish can induce cell death in colon cancer. This further realizes the possibility of glucosinolates being used as a future cancer cure. Horseradish can relieve pain: Because horseradish increases blood flow, it helps with pain relief. Horseradish paste can bring relief to swollen joints, muscular pain, gout, and arthritis. Horseradish can help lower blood pressure: Potassium is necessary to regulate the flow of cellular fluids and blood vessel tension. Being deficient in potassium can cause blood pressure to rise. This increases the risk of cardiovascular diseases, heart attack and stroke. Horseradish is a good source of potassium and including it in your diet helps to lower blood pressure and regulate fluid and nutrients between cell membranes. Horseradish may boost metabolism: Although horseradish is packed with valuable proteins, vitamins, and minerals, it is low in calories. Because of this, the protein can be directly converted to energy, new tissue, muscle or cellular material that can help repair and keep toxins at bay.